Having been involved with football for over 36 years, Brad Dunn is a welcome induction to the WAAFL Hall of Champions as a Champion. Dunn began his involvement in the WAAFL with the Mt Lawley Amateur Football Club in 1979. This was the beginning of a great playing and coaching career in amateur football that would showcase multiple premierships, fairest and bests, and state and All Australian representation. Dunn made a mark from his first season in the WAAFL. He was runner up in Mt Lawley’s A-Colts fairest and best in 1979. The following year he was selected in the WAAFL State Colts Team and won his first of nine premierships as a player in A Colts. His second premiership was in 1981 again in A Colts in the same year he was runner up in Mt Lawley’s A Grade fairest and best. In 1982, Dunn began his state representative career. He would go on to represent WA seven times in the WAAFL State Team, and was senior coach in 2000 and 2001. He was selected as an All Australian Amateur in 1985, 1986 and 1988. Regarded as one of amateur footballs finest centremen, Dunn won five A Grade premierships between 1983 and 1988, winning the B.J Giles Medal for best on ground in 1983. During the same period he was Mt Lawley’s A Colts Coach leading teams to three grand finals and winning a premiership in 1984. 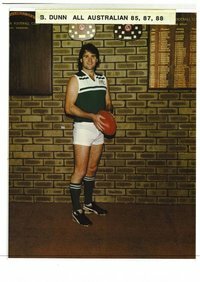 He won Mt Lawley’s A Grade fairest and best in 1983, 1984 and 1988 and the club’s C Grade fairest and best in 1991. He coached Mt Lawley’s B Grade premiership in 1997 and was the club’s A Grade Coach in 1998. He further coached Wembley A Grade in 2002. He finished his career playing 220 games for Mt Lawley and being awarded club Life Membership in 1989 and induction into Mt Lawley’s Hall of Fame in 2013. A skilled footballer, the WAAFL inducts Brad Dunn as a Champion into the Hall of Champions.